Why alone in the middle of a field? Were they once surrounded by other mighty oaks? Maybe they were near a house that is no more? A place to allow the farmer a shady place to rest? Patrick, my guess is that this area once was part of a much more extensive oak grove. Native peoples depended on oaks as a food source. Because mature oaks are fire-resistant, seasonal fires were used to clear the forest floor. As a result, a succession of trees was prevented because native fir seedlings could not take root. 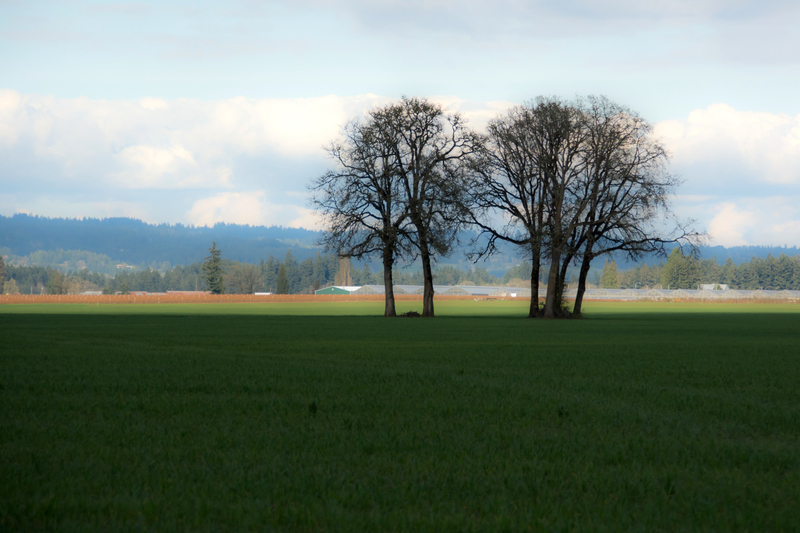 Garry Oak Eco-systems were common in the Willamette Valley of Oregon. That changed as a result of western expansion when lands were cleared by settlers for farming, and the end of seasonal burns. Here’s a disappointing update on that particular landscape. We drove by today. The oaks are leafed out- beautiful and green… But the lush green fields have been transformed by spraying. They are all Round-up Yellow.